Are you one of those people who only pulls out their crock pot during the winter months and forgets all about it during the summer? I am. I don’t know why. As much as I don’t feel like cooking on those super hot days, I could easily use the crock pot and have something all ready for me when I come home. That’s one of my cooking resolutions for the year, to use my crock pot throughout the year, not just when its cold outside. 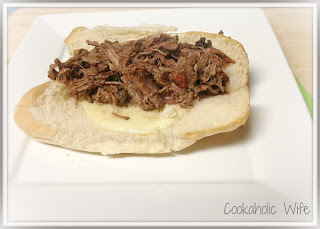 Since the crock pot does everything for you in this recipe except toast the bread and assemble the sandwiches, I made it one day where I had a lot to do once I got home from work. 1. Place the beef roast in a 6 quart crock pot and top with onion, oregano, basil, cayenne and salt. Add the tomatoes and beer on top. 2. Cover and cook on low for 8 hours. Shred the meat with two forks and stir back into the crock pot. 3. Partially toast the hoagie rolls then add a slice of cheese on each. Return to the oven to continue toasting. Divide the meat mixture among the toasted rolls. These were some tasty sandwiches. I think I’d like a little more onion and tomato to go along with the beef, but otherwise I really enjoyed them. They’d be great to serve on sliders or as full sandwiches for a football party or just any event.